Detail: Our IP Camera are using High quality glass lens, clear vision viewing through your smartphone anyway any time. This IP Camera with 1/2.5" Color CMOS Sensor and 1,000k Pixels High-Quality Lens can send live video & sound through the Internet to a web browser anywhere in the world. Once you choose it, you will be amazed at its abundant features and richer functionality. Meanwhile it maximum supports 32GB TF card, you can record what happened in your life faithfully, vividly and permanently. - Lens: 3.6mm / 6mm . - Infrared: 11 IR Led Ф 5mm. Infrared: 10m, IR Cut technology. - Sensitivity: [email protected] (AGC ON). - 355 degrees horizontal rotation - 90 degrees vertical rotation, 8 direction control. - Email notification alerts support. 1 in / 1ra. - Connectivity: RJ-45 (10 / 100Base-T). Protocol: IP, TCP, UDP, HTTP, HTTPS, SMTP, FTP, DHCP, UPnP, RTS, WPS. WIFI : IEEE 802.11b / g / n.
- Remote control over the network. Support ONVIF. IP cameras are pretty much one of the most reasonable ways to enjoy the overall looks and feel of a good surveillance system in my opinion. I was so happy with the way it provided a reasonable resolution and low price. IP cameras should now be upgraded with better latency chips or a better sensor, I really would like better video quality with improved resolution for better face recognition. IP cameras are not only the best in terms of usability but are also exceptionally discreet in terms of presence. They require little space and wiring and even though they are not at all big the image quality is great. 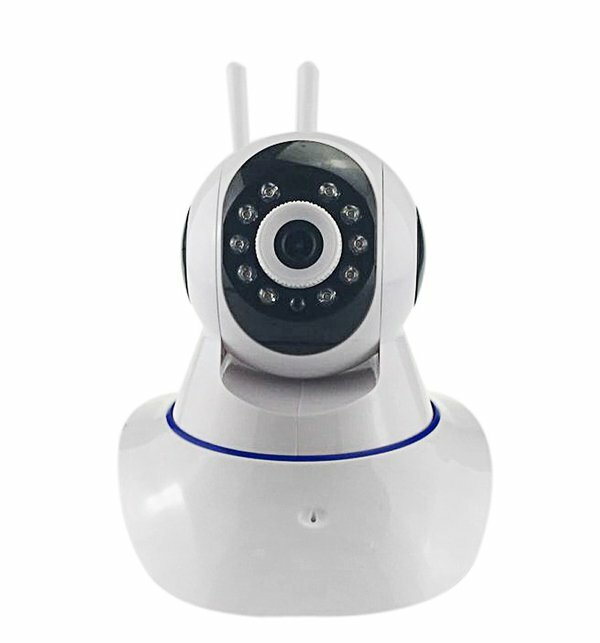 You are looking now latest IP Wireless Camera 360 With 2 Antennas price in pakistan market 2017 including in all major cities, IP Wireless Camera 360 With 2 Antennas Price in Karachi, IP Wireless Camera 360 With 2 Antennas price in Lahore, Islamabad, Faislabad, Pesahwer, Quetta, Multan, Rawalpindi and many more cities.